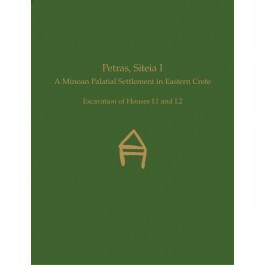 This volume is the first of two that represent the final publication of Sector I of the Prepalatial–Postpalatial Minoan urban settlement and palace of Petras, Siteia, located in eastern Crete, and it presents the results of the excavations conducted there from 1985 to 2000. Individual chapters focus on the architecture (Tsipopoulou), cooking wares (Alberti), Early Minoan (EM) and Middle Minoan (MM) I pottery (Relaki), a unique example of an EM–MM amphora stamped with a seal prior to firing (Krzyszkowska), numerous miniature vessels and figurines (Simandiraki-Grimshaw), and a study of vessels (primarily Neopalatial) with potter’s marks (Tsipopoulou). A subsequent volume will discuss in more detail the Neopalatial and Postpalatial pottery from Houses I.1 and I.2 and focus on the main Neopalatial period of the Petras settlement and its Postpalatial re-occupation.